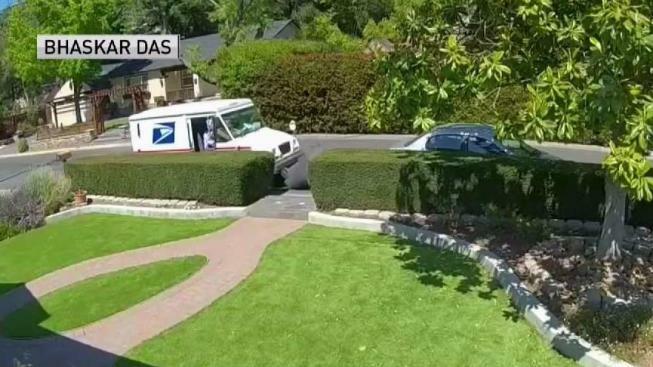 Surveillance video from a home in Los Gatos captured a postal worker apparently going postal on a garbage can last week, and neighbors say its not the first time the mail carrier has behaved badly. The incident happened Friday on Oak Grove Avenue, where a trash can apparently was blocking a mailbox. The carrier decided to take matters into his own hands. The surveillance video shows the mail carrier hits and pushes the garbage can before the can tips and dumps garbage on the street. Neighbor Susie Salfen said the mail carrier was being belligerent. "It was really unkind what he was doing," she said. "Some people are talking on NextDoor that he seemed to be OK doing it, and it was a really bad thing." U.S. Postal Service spokesman Gus Ruiz said it’s a regrettable moment but one the carrier can learn from. "It was absolutely wrong for the postal carrier to push down the garbage can. We apologize for that," Ruiz said. "We plan to use this as a teaching opportunity for all our carriers." On Tuesday, the mail carrier and a supervisor visited the home where the video was shot. The carrier declined to comment. Salfen said the same carrier displayed negative behavior before at her house. On May 12, she left canned goods to be picked up for the USPS's own Stamp Out Hunger food drive. "He left my bag here, didn't touch it, wasn't going to pick it up, and he never did," Salfen said. The father of the man whose garbage can was knocked down told NBC Bay Area the postal carrier did come to his house and apologize directly to him, but offered no explanation for why he did it. The postal service said it cannot comment on whether the mail carrier has been disciplined because it is a personnel issue.